I got this recipe years ago from a friend and adapted it a bit here and there. This recipe continues to be my go to for years and with just a few ingredients you're almost guaranteed to always have in your kitchen, you'll be wanting to bake this bread weekly! Helpful Tip: I use the dough hook on my KitchenAid Mixer for this bread which means sames me so much time kneading and makes this recipe even easier! This recipe makes two regular loaves of white bread - feel free to cut the recipe in half if you just want one loaf (or make two - and share one with a friend!). This bread tastes great when making sandwiches, or my favorite, warm with some Savannah Bee Company honey! After a long day of work there's nothing that feels better than throwing on your favorite pair of comfortable sweats pants! And while "sweats" may not be the most appropriate of attire for all public activities (ie: first date, meeting your future in-laws, job interview, etc.) some days just call for sweat pants! I recently discovered a new company, "65 MCMLXV", who sent my husband, Ben, a pair of their black/gray sweatpants, at no cost to facilitate this review, and not only am I sharing all the things he loves about them - but I've got a giveaway for you too! My kids love getting the opportunity to check out some of entertainments upcoming movies and DVD's but I have got to say, when I heard they were getting the opportunity to check out the new season of Scooby Doo, I was probably more excited than they were! I grew up with Scooby Doo and loved trying to figure out each and every "who done it?" episode! I was thrilled my kids were getting the opportunity to check out this new and updated Scooby Doo and they seemed to have just as much fun with all of Shaggy and Scooby's antics as I used to! Pick up your own copy of Be Cool, Scooby-Doo Season One Part 1 - available on DVD tomorrow, February 23rd! Though Be Cool, Scooby Doo! doesn't look exactly like the Scooby Doo that I grew up with, the fun and the mystery is still the same. Sometimes it's hard to get used to change. My oldest still remembers watching original episodes of Scooby Doo and said she missed how the old characters looked and how their voices used to sound but she, along with my other kids, have still enjoyed every episode and this DVD has become a frequent request during TV time at our house! Click HERE to visit Scooby Doo online where kids can enjoy games, vidoes, downloads and more! Follow Scooby Doo on Facebook and Pinterest to catch up on all of the latest Scooby Doo news, episodes, and more! THREE lucky readers will win a DVD copy of Be Cool, Scooby-Doo Season 1 Part 1! The giveaway will end March 7th 2016 at 11:59pm. Open to residents of the US only and must be 18 years old to enter. Enter using the Giveaway Tools entry form below. Disclosure: I was sent the items listed above at no cost to facilitate this review. Prize fulfillment is the responsibility of Warner Bros. and not Our Southern Style or Thrifty Nifty Mommy. This giveaway is not associated with Facebook, Twitter, Instagram, or Pinterest. Most people groan at the thought of making twice baked potatoes, simply because it just seems like extra work. My family loves their potatoes though and I"m always looking for ways to create new potato recipes and figured it was time to come up with my own Twice Baked Potato recipe - it is after all, the best of both worlds - baked and mashed all in one bite! A lot of the prep work for this recipe (frying and chopping the bacon, chopping green onions, shredding cheese) you can do while your potatoes are baking. Bring Home Lego Ninjago: Masters of Spinjitzu Season Five February 16th! We have several self-proclaimed "ninja warriors" in our house - the youngest being age 3 and the oldest in his 30's - and naturally, were all very excited to sit down with some popcorn and the new DVD of Lego Ninjago: Masters of Spinjitzu Season Five! Lego has been a huge hit for years, both for kids and parents, with their creative and endless indestructible building blocks and sets and now with Lego roaring onto the entertainment scene with movies, video games, TV shows, and more, there's even more ways and reasons to love everything Lego! The high energy characters of Lego Ninjago: Masters of Spinjitzu Season Five draw kids right into the action and my boys especially loved every episode! Read on to hear more about all the new Lego Ninjego fun and to enter to WIN a DVD copy of Lego Ninjago:Masters of Spinjitzu Season Five of your very own! Disclosure: I received the item pictured above, at no cost, to facilitate this review. Nothing puts a smile on my boys' faces like getting to help Mom with reviews! When they heard a new review from Toy State was on its way, Elijah and Levi waited anxiously every day for the mail man to arrive with their new car. Having had the privilege of checking out several cars for Toy State, I knew that not only would my boys have a lot of fun playing with their new car, but I've come to experience great quality in everything that comes my way from Toy State. 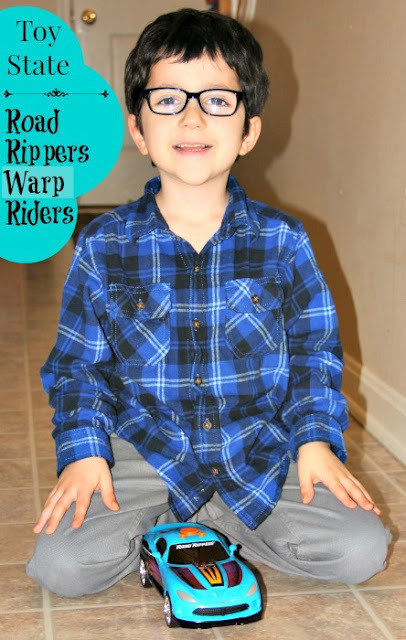 If you are looking for the perfect toy to take your boy's Easter basket to the next level, or need a gift for an upcoming birthday or special occasion, the Road Rippers Wrap Riders car is just what you're looking for! Get Her Something Different This Valentine's Day - Give Her An 88 Handbag! For about 6 years while I was in college, I had one of the best jobs in the world - I worked at a flower shop in downtown Minneapolis, Minnesota. Though it wasn't necessarily what you might call a "rewarding job", though it did have its moments, most of my work days were spent looking at beautiful flowers and generally, making people smile. Valentine's Day was always an absolute madhouse and I remember one holiday very clearly. We weren't too far away from closing up the store when a lady arrived with a vase of long-stemmed red roses, from her husband, that we had delivered to her earlier that day at her office. She walked to the counter, slammed the vase down on and said, "I don't want these!" (Not the normal reaction you would except from a woman whose husband not only remembered Valentine's Day - but also send her roses). As we tried to calm her down, thinking there must have been something wrong with the flowers, she quickly informed us that "Any idiot can order flowers, how hard is it to pick up a phone and order roses". Long story short, after I picked my jaw up off of the floor, told her we would refund her husband's credit card, and calmly assured the next guy in line that buying flowers for his wife was a good thing, I realized this poor woman maybe had a point. It is pretty easy to order flowers. And not that it's the amount of work or money that goes into a gift that decides its value, as the saying goes, "It's the thought that counts", and what she wanted was a thought that took longer than it takes to dial a telephone. This year, don't just stop at buying flowers for your special Valentine! Give her a gift that she will adore long after the flowers die! 88 Handbags sent me the gorgeous Natalie Taupe Color Block Tote, at no cost to facilitate this review, and not only do I have a great review to share, I've also got a giveaway!